This form is for the lease of agricultural land acreage for the purpose of growing crops. The landlord receives a portion of the net proceeds from the sale of the crops grown on the premises as rent under the lease. The tenant has an option to renew, and may construct improvements on the premises at its own expense. This Lease ("Lease") is made as of _________________, by and between AGRICULTURAL PROPERTY LANDLORD, INC., a __________________ corporation (“Landlord”), and AGREEABLE AGRICULTURAL TENANT, INC., a _________________ corporation (“Tenant”). FOR AND IN CONSIDERATION and upon the terms and conditions hereinafter expressed, Landlord does lease, and hire unto and in favor of Tenant, all of the properties (sometimes referred to herein as the “leased premises”) now in _________ cultivation in _________, _________ described on tract or parcel of land on the sketch of property attached hereto as Exhibit "A". 1) This lease is made for the purpose of Tenant’s operation of the leased premises as a plantation for the growing of _________. Tenant agrees neither to commit nor permit others to commit waste upon the property leased, to operate the premises as a good and prudent husband man, and to properly care for and cultivate the fields. Tenant shall have no right to assign this lease or sublease the whole or any part of the leased premises. 2) During the term of the lease, Tenant shall keep approximately two-thirds (2/3rds) of the cultivable land cultivated in _________, subject to quota or other regulations of the United States Department of Agriculture or other governmental agency, Federal or State, and unless prevented by weather or other conditions beyond the control of Tenant. 3) Cultivated but fallow lands not used for _____ shall be plowed or otherwise treated for control of undesirable weeds and grasses or planted in _____. 4) This lease is made for a period of five (5) years, commencing as of the date hereof and ending with the _____ day of ________, 200__. Tenant shall have the right and option to renew this lease for an additional five (5) years on the same terms and conditions as set out herein. Tenant shall notify Landlord by certified mail, on or before sixty (60) days, prior to the expiration of the primary term of Tenant's desire to exercise its right to extend the lease. 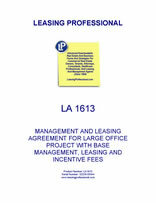 5) This lease is made in consideration of the stipulations and agreements herein expressed, all of which are material and without which the same would not be made, and the payment of a rental by Tenant of one-fifth (1/5th) of the net proceeds from all _________ harvested and sold or delivered to mills, less any and all mill processing fees which are the custom of trade in the _________ industry, together with all subsidy, incentive or benefit payments (excluding Agricultural Conversation Payments) accruing to the said one-fifth (1/5th) share of Landlord from the United States Government or any of its departments or agencies, for each of the crop years during which this lease shall be in force and effect. Tenant shall have the right to harvest _________ from the leased premises for planting _________ on the leased premises for which Tenant shall owe no rent.